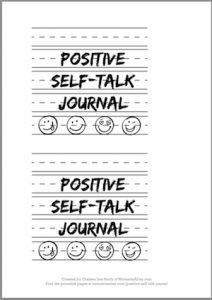 If you are looking for a way to encourage positive self-talk at home or school, check out this simple yet effective journal activity. 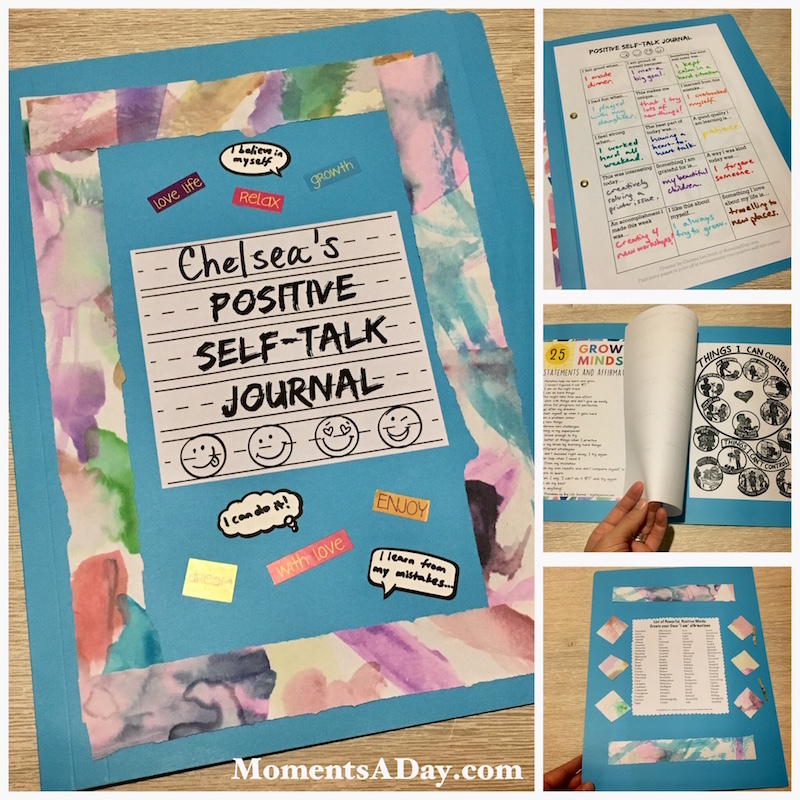 The journal was made for children ages 7-11 years old in mind, however with some adult help even younger children could use it as well. I actually really enjoyed filling in the page, too, so it could become a whole family affair if you wish. You may wish to decorate a cover page, notebook or folder (as pictured below) or simply stable a few pages of the journal pages together. Let your creativity run wild! 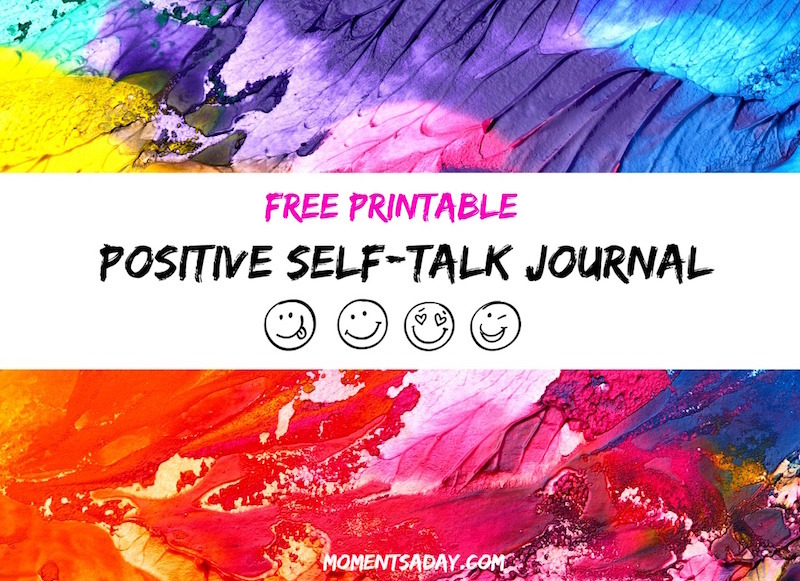 Besides the two free printable positive self-talk journal pages which I created (and you can download below), I used a few sheets from the Growth Mindset Kit of Big Life Journal as well as this affirmation word list by Dr. Minette Riordan to decorate the folder pictured above. We also used stickers as well as strips of old watercolour paintings for the front and back covers. Another fun resource to go along with this activity are the Class Dojo videos on Growth Mindset. 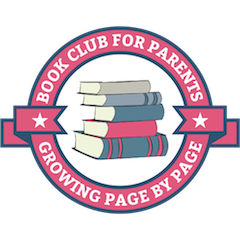 Check out the short videos and discussion guides. Second, the inner pages of the journal. 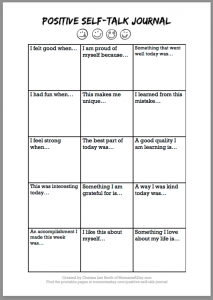 You may wish to use it as a one-off assignment where the child fills in every square on the page, or fill in one square per day over a period of time. Hope you enjoy this resource! I would love to see how you use it. Feel free to tag me on Instagram @momentsaday or share a photo on the Moments A Day Facebook Page. What a wonderful project for children and adults as well, Chelsea. I love what you are creating and how you are inspiring families to think and be positive. Beautiful important work! Thanks for tagging my post in your article. Thanks So much for this valuable resurce! I Love it!!! and already used it! !